In rare cases, the AF function on some PowerShot IXUS 175 / ELPH 180 / IXUS 177 compact digital cameras may not operate properly and focus may not be achieved. Customer support for this phenomenon is described below. Only some PowerShot IXUS 175 / ELPH 180 / IXUS 177 compact digital cameras are affected by this phenomenon. The phenomenon may occur in cameras whose first two digits in its serial number are "11", "12", "21", "22", "23" or "24". ​"11xxxxxxxxxx" "12xxxxxxxxx" "21xxxxxxxxxx" "22xxxxxxxxxx" "23xxxxxxxxxx" "24xxxxxxxxxxx"
('x' can be any number). 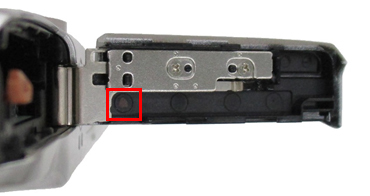 If the camera has a black marking on the inside of the battery cover, as shown in the image below, this indicates that your camera has been checked and the issue has been corrected. If the camera meets the serial number criteria listed above and does not have a black marking on the inside of the battery cover, and if the phenomenon occurs and is confirmed by Authorized Canon Service Facility, we will repair the unit free of charge. If you own one of the affected cameras, please contact our Customer Service Facility.